While buried with other work obligations, I was really pleased to have the chance to work with some really talented people at this year’s TOJam 9, the largest game jam in Toronto. For the uninitiated, it means that participants in teams of their choosing have 48 hours the weekend of April 25 to 27 to create a game from start to finish. For TOJam, there was a great creative atmosphere of students, aficionados, and professional game developers all collaborating together. The point is to try something new, or work with a new team, to put together a playable prototype. If it doesn’t work, it’s okay! It’d still be a productive weekend of experimentation. We created a team with Eric Roberts as Programmer, Oskar Pruski as Composer/Sound Designer/Artist, Mikki Benaglia as Artist, and me, Tanya Kan as Designer/Writer/Artist. Because Eric Roberts has a lot of experience with 2D games, I was inspired to try my hand at designing a 2D game as well. He told me to stick with my strengths, which is writing and art direction, while I am simultaneously trying something new. I feel like this is a great advice for many jammers, especially for those, like myself, who have not played the designer/producer role under a jam’s time constraints. 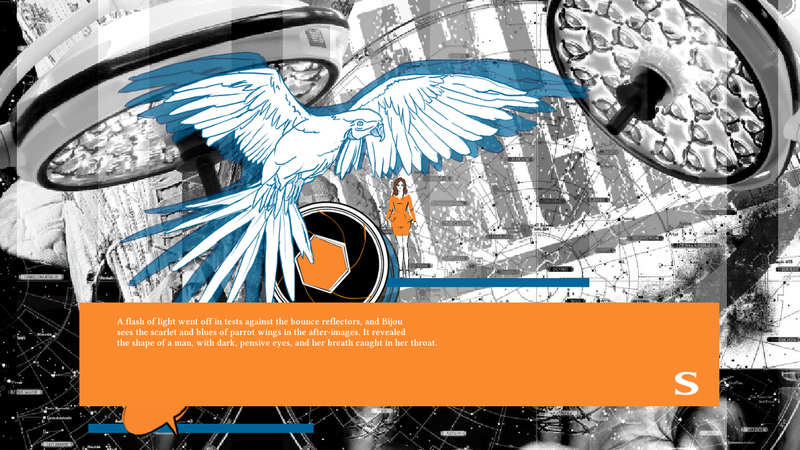 As such, I designed an interactive novel-platformer game hybrid, under Eric’s advice. The whole idea is that whatever one player goes through narratively will not be the same experience as another player’s, even if the number of platforms is static. The story is about a superstar so stressed out by the pressures of her industry (and plastic surgery) that she skips in and out of time, and creates disarray of her “private” life as a result. The narrative itself has been living with me for some time. It first inception was in my little Twine experiment, Sound is a Spectrum, which is playable (but narratively incomplete) on this site. As also recommended by TOJam organizers, we came prepared with a list of programming priorities. I also created a spreadsheet of all of the game writing/dialogue and corresponding art assets. I created a Grooveshark playlist of the atmosphere that I was trying to set. On Google Drive, I defined the look of the game with reference images with consultation with Mikki, and then we all tried out these experiments at the jam itself! Eric went with an engine structured around 2D called Godot, currently in beta, as he wanted to test drive it at the jam. After the jam, I realized that I quite like the idea behind the game as a free release. As such, Mikki and I have continued to adapt the game. We changed the game engine from Godot to Unity, even though the languages are not compatible, because I am trying my hand at programming for the first time. I went with Unity because I really like the documentation and community that Unity has to address most of my questions, and I know that the Engine is flexible around the development needs of my future games. It was definitely an interesting learning curve to say the least, but not as much of an uphill climb as I feared! The other part is also that I can ask silly, simple questions of my Toronto friends about programming. Now, for this new version, we have a lot more art assets to augment the story. Each platform is meant to have a different visual design to hint at the story inside each of its collectable dialogue boxes. Mikki designed and illustrated about 2/3rds of the platforms and they inspire me to have better design for those that I am in charge of! 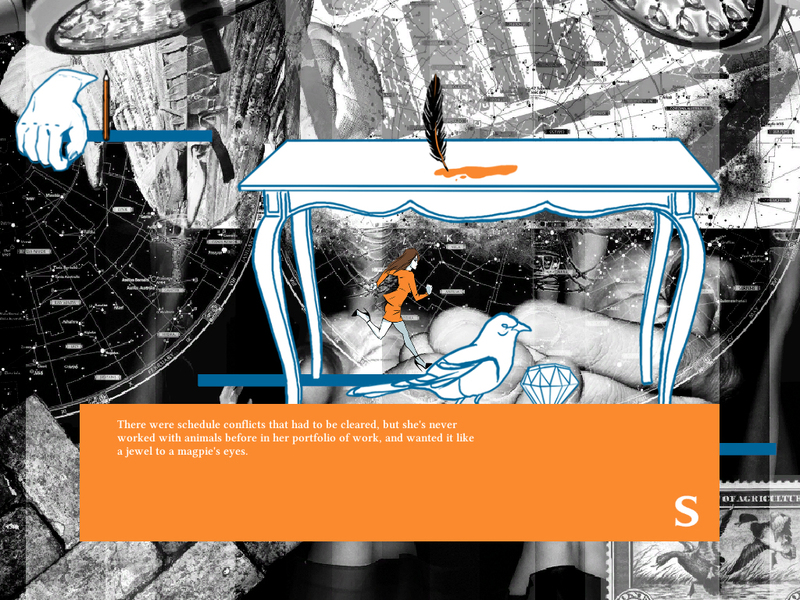 We tightened the art style so that it is more unified in the fashion illustration meets Dadaist hybrid. I am also playing around with the inclusion of some harder-to-reach platforms so that we get more narrative variety, and have some great friends to help out with the programming side! 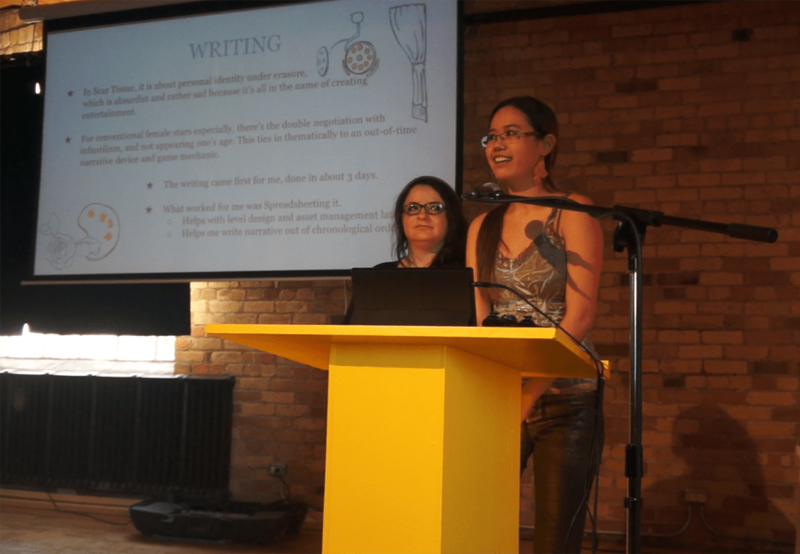 Mikki and I were very kindly invited to present our game at Dames Making Games Speaker Social, where we shared some of our design considerations! It was a fantastic experience, where we received positive and constructive feedback. Thank you DMG and Bento Miso! Here’s the unabridged Powerpoint slides if anyone’s curious. Update 2015: Scar Tissue is currently on hiatus. In hindsight, I had a lot of fun new experiences in the last month and a half. This was despite my developing minor but chronic medical complexities since January of this year that lend itself to a whole host of stresses. Two months and a few days ago, I joined EVE Online after very inconsistent or indirect gaming experiences for years and years, such as logging into MUDs for socializing with old friends (that’s text-based multi-user dungeon for you folks playing Crysis on Ultra mode) and watching my boyfriend play his PS3 titles. In fact, I knew what I was getting into when I was joining EVE Online. I had meant to play the game because I was thrilled by its portended difficulty. Also, less than two months after establishing my account, I would’ve completed a 45 page essay on EVE Online’s game interface and interactivity towards my degree in Cinema Studies. This was a few weeks ago. Now, looking back, the ache of the stress over academic pressures and the debilitating lack of self-confidence had faded almost into nothingness. Not just for this one paper, or this one class, but now I look back over the course of the last year and I think to myself: Wow, I did that. With the guidance and the kindness of many people, I have played hard and I have worked hard. Flashfresh – The Pirate. : Women? In MY SPACESHIP? Is she from Mars as well? CrazyKinux pronounced that it was near impossible for him to designate who is actually ranked #1, and whom #10, because of the complexity and expansive style and content of all entries. Regardless of where I am placed, I am honoured to be mentioned at all in the 10th spot, on the same list as the talented individuals above me. There is much that I would like to learn from the diversity of style, humor and experience that these and other entries exemplify. The lovely thing is that creative activities such as this generate continual discussion, from forums to TeamSpeak to commenting on other blogs, and are furthermore written by individuals of differentiated interests and backgrounds. After all, I take the attitude that games do matter, even when actions taken within it appear to only affect a self-sustaining alternate universe, with a certain set of rules and premises for conventional behavior. Indeed, they help us build connections between peoples and ideas, both in mundane and exceptional actions in our lives.